Thanksgiving is my favorite holiday for a multitude of reasons: food, fellowship and Friday, black Friday. While this year’s Thanksgiving was quiet, I did make the most of the four-day weekend. Growing up with a shopaholic meant I spent many hours bored in department and discount stores while my mother scoured racks for clearance deals. My mother loved to tell people how much my outfits cost. This was back in the 80’s and 90’s when department stores had huge discounts on merchandise. I don’t know what changed but there aren’t discounts galore anymore. The ability to brag that an entire outfit including shoes cost less than $40 has diminished. I actually hated Black Friday. Waking up at 6 a.m. to shop until noon wasn’t my thing. However, something changed when I spent my first Thanksgiving in Maryland. I didn’t like it and I decided to shake the blues of being away from “home” by shopping. So I marched myself to WalMart at the crack of dawn and got a lovely $99 top of the line sewing machine and a $39 portable DVD player. And then headed to Sears for my first digital camera. Hilariously, I use none of these things currently. My sewing ability is limited to hemming garments though I keep saying I will take sewing lessons. The DVD player was used for exactly two bus trips to NYC before I determined it to be more of a nuisance (because I prefer to limit myself to one bag). I dropped the camera in a fountain in Vegas and it never recovered. Black Friday is very controversial. My name brand devotees despise anything but the best so scoff at most doorbusters. I am not an electronic brand junkie. If the best television costs $800 and the second best costs $600, I will be buying the $600 one and spending the $200 for entertainment money. I prefer experiences to things. However, occasionally the best technology does go on sale on Black Friday (rarely and usually at deadly Wal-Mart, which has just devolved into chaos). Ultimately, I stick to household items, clothing and appliances. I know that there are actual deals to be had and I learned to love the thrill of getting a great deal. No Best Buy ever. People camp out and I don’t wait in line. Also, it takes forever to check out. I actually waited in line for 45 minutes without moving once before giving up. Occasionally, I go later in the morning and get the deals that the masses didn’t care about. After all of that shopping, I treated myself to the Faith Evans concert. 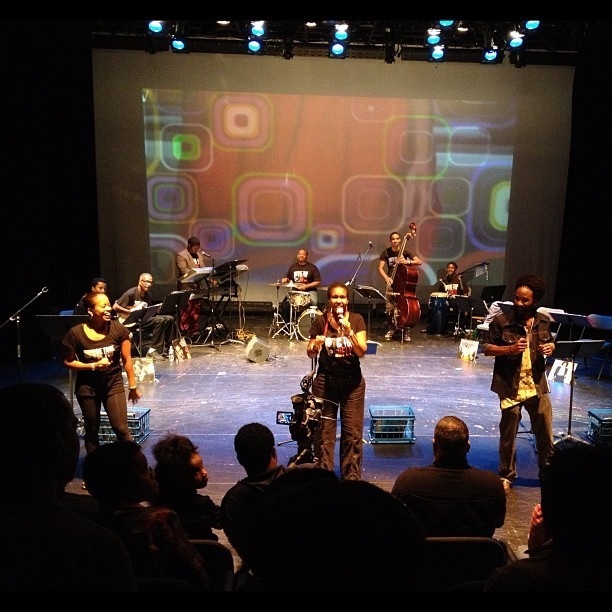 Despite my numerous times at the Howard Theater, I have never eaten there. I always eat before going anywhere, even meeting people for dinner. This is for self preservation. I understand the food wasn’t good, but the show was awesome. Faith, sang her face off, as the old folks say, and was so energetic. She also had the best, happiest backing band that I have seen in an extremely long time. I saw her a few years ago at For Sisters Only, which never looks right in the new Convention Center, and she was okay. I reckoned that maybe I should have seen her in her prime and shrugged it off. I actually tried once when I first moved to D.C. and the show was cancelled. That incident leads to one of my best stories of how I once spoke to the Vice President of Ticketmaster. Back to Faith, boy was I wrong. Maybe the venue, time and event didn’t lead to a good show at the Convention Center, but we definitely got the best of her last Friday. I left in awe or should I say with Tears of Joy. Too corny. Oh, okay. I remember when I was younger I saw an Oprah episode called “Are You Cute As You Can Be?” I loved the premise because many have stated that they don’t find Oprah to be a traditionally beautiful woman. As an aside, I never understand what people hope to accomplish by telling someone that they find him or her to be unattractive. Now what? That person just disappears. I love this advice. I live this advice. Plus, it works. Following it makes does indeed make you your cutest. If you follow it well. Hardly, any fault can be found in a polished, well put together woman. This can be difficult in the well-scrubbed world of Washington, where women believe the key to being treated seriously is to look serious. Lotions, potions and notions have always made me happy. However, wearing lipstick in certain DC environments can make you look absolutely frivolous. Does that mean you should wake up, wash your hair and secure it with a clip everyday? Of course not. What’s the fun in that? So for this I’ve started Stay Cute Mondays. Enjoy. For Rule 5, I have naturally dry everything—skin, scalp, lips. Therefore I developed a wonderful daily three-step system to cure my least favorite beauty faux pas: chapped lips. I hate chapped lips. And the fix is super cheap. So when I see someone with chapped lips, I often wonder where her life went wrong. Supple lips are the key to a great smile. This trick always works. Always! 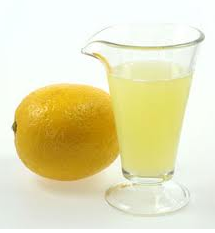 Rub a little lemon juice on your lips. It may sting if your lips are cracked, but melts away all of the dead skin. A good second best is a lovely lip scrub from Lush. I like Mint Julip. I’ve seen recommendations to scrub with a toothbrush, but I don’t find this particularly effective. My next step is to soothe my lips with a solid lip balm. Amazingly my favorite lip balm I received free. 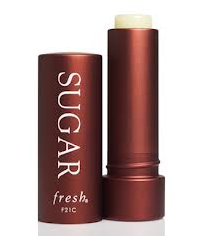 I love Fresh Sugar lip balm which I got as a free birthday gift from Sephora. I just love it. It gives my lips a great base for the next layer. Another favorite was another serendipitous find—Panama Jack vanilla lip balm. It was another freebie as it was a bonus to a sunscreen purchase. It’s so soft and smoothes on easily. I find that important in a lip balm for those of us with full lips. This is odd but true, but I am not fond of the color of my lips. They are a soft brown, not a vibrant pink. Because of this I always wear a tinted lip gloss with moisturizing ingredients. My personal choice for years was Kiehl’s Lip Balm SPF 15. However, I discovered that my beloved standby has been discontinued in September 2012. 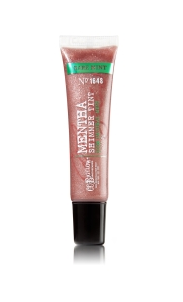 A good runner-up is the Mentha Shimmer Tint from Bath and Body Works. These steps will ensure one aspect of your great smile looks great. Even through winter’s cruel, cold months. Welcome to my blog. The title is a play on something my grandfather used to say about me and my cousin: “Y’all sure do run the street. Bang, bang and you are off to the next…” It’s perfectly fine as my grandfather was/is a bonafide streetrunner himself. So it really runs in our genes. Enjoy.